Is your website being found by the right people for the right reasons? Do you know what people are actually searching for online? Find out all you need to know about keyword research to help your business grow. As we explained in our latest Content Kitchen video What is keyword research, you should be using keyword research to plan the content of both your website and your blog. But what exactly is it? Well, keyword research is a way of finding out which words and phrases people use to search for certain products and services online. It forms the basis of any search engine optimisation (SEO) strategy, which means following certain content, layout and formatting conventions to help your website rank higher in relevant searches. It’s important to carry out at least some keyword research for your business to ensure you’re using the right terms in your marketing, so that your website can be found by the right people. It’s no good simply assuming you know what people are searching for – you can’t possibly know! We all think differently and we all behave differently online. Remember: you are not your customers! We all think differently and we all behave differently online. Remember: you are not your customers! We’re not an SEO agency, but we know the value and importance of good SEO measures, like keyword research. SEO is a vast and complex subject, which is potentially very time consuming. At Wildheart Media we have a lightweight approach that gets good results. You can actually carry out very useful and insightful keyword research in a relatively short amount of time. Our focus is on small businesses who don’t necessarily have the time and money to invest in extensive keyword research and SEO tactics, like pumping out 3 blog posts per week of 1,500 words or more. 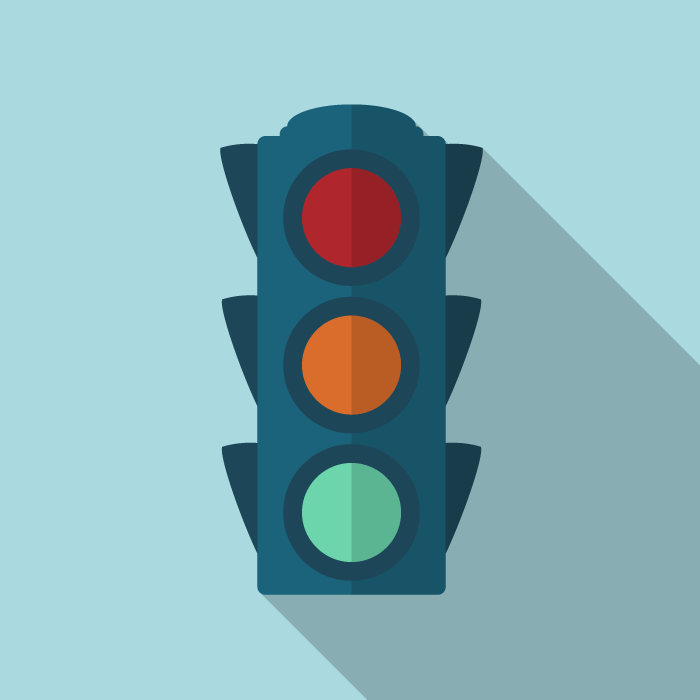 So our approach is simple – we’re not trying to attract masses of traffic to your site; we’re merely trying to get the right content to yield the best results on each page of your site. So, you might only get 100 visitors to your site in a month, but those 100 visitors are far more likely to convert into paying customers due to our content-focused approach to SEO. We’ve developed a simple keyword research process for our customers, which gives good results every time. We then incorporate these results into our customers’ content strategy and marketing activities to help their business get found by the right audience. Here we share with you the process we follow for both our own and our customers’ businesses. We think Google Adwords Keyword Planner is the best tool for your basic keyword research. As it’s a Google product you’ll need a Google account to get started, but you can easily set one up if you don’t already have one. Enter each of your keywords into the Keyword Planner tool by selecting “Search for new keywords using a phrase, website or category”. You don’t need to complete all the fields here – just type your keyword into the “Product or service” box, then adjust the targeting criteria if necessary. If your business is based in the UK you can leave the settings on the default: UK, English, Google. Then click “Get ideas”. See the screenshot below – we’ve used the term ‘content marketing’ as an example. On the following page you’ll be presented with the results – see the screenshot below, showing results for our ‘content marketing’ search term. First, it will show you the average number of monthly searches and competition level for your search term – in this case 1k-10k, medium. The competition level is based on the number of web pages that are currently being optimised for this particular search term. 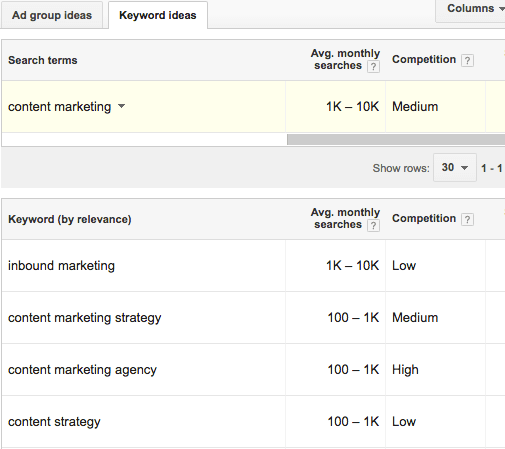 Below your search term results you’ll see a list of keywords by relevance. This is a very useful tool because it shows you other keywords related to your original search term, which you may not have thought of. So you can go through this list and pick out any additional keywords that are relevant to your business. The best results are those with a high volume and low competition. We think the best way to capture your results is in a spreadsheet, or gsheet if you’re using Google Docs. 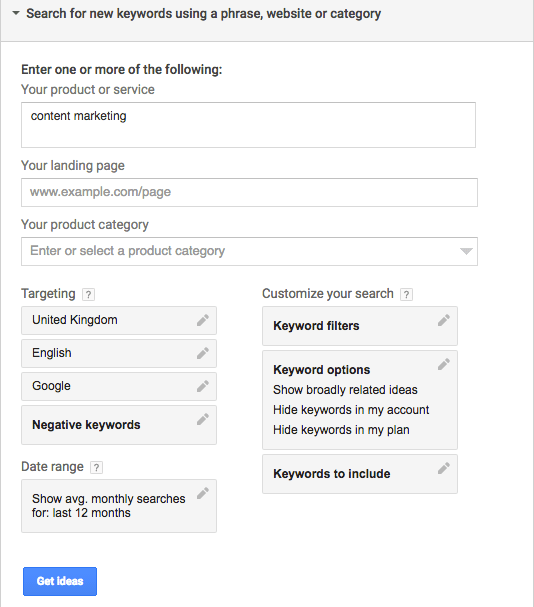 You can start with your original list of keywords and add any additional ones suggested by the Keyword Planner. We’ve also added notes against some of the entries to capture thoughts, ideas and patterns we’ve noticed in the results. Once you’ve captured the results for, say around 30-40 keywords, you can start delving a little deeper by refining and experimenting with your search terms. For example, in the extract above you can see that the phrase ‘starting a blog’ has a monthly volume of 1k-10k, but when you change this to ‘starting a business blog’ the results fall dramatically to only 10-100. This means hardly anyone is searching for this phrase online. 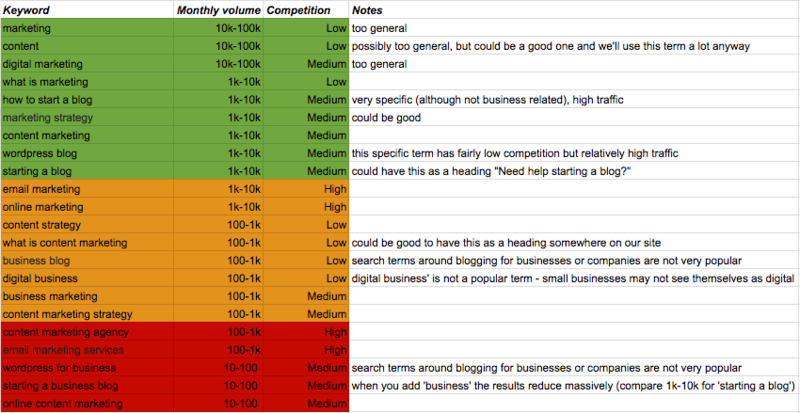 You can also refine your results to include more long tail keywords. These are longer and more specific phrases that people use to narrow down their search. For example, if you were looking for a vegan restaurant in Bristol, rather than searching for “Bristol restaurant”, you might search for “best vegan restaurant Clifton Bristol” – this is known as a long tail keyword. Long tail keywords tend to get less search traffic but can be more valuable to your business, as they’re more likely to result in visitors finding exactly what they’re looking for on your site, and therefore converting into paid customers. This can be especially important if your business operates in a specific niche, as you want people to be able to find your website by searching for very specific, niche terms. For an in-depth look at long tail keywords, check out this article from Yoast. 8. Put your keywords to good use! These last 3 items form part of your Yoast SEO for WordPress plugin, which we recommend installing if you haven’t already. It’s also good practice to use your keywords throughout the text on your website, but a word of warning here: search engines will actually penalise you for overuse! So, rather than just dotting your keywords around willy-nilly, you need to make sure they’re incorporated into your web copy in a way that actually makes sense to your readers. You might need to rewrite some of your text, but using relevant, well-researched keywords in your copy is one of the best things you can do for organic SEO, to help your site rank higher in relevant searches. Need some help with your keyword research? If this all sounds too much like hard work, or you don’t have time to carry out the keyword research your business needs, we’re here to help. Our SEO package includes detailed keyword research as standard, as well as competitor analysis, topic research and customer profiles. We’ll help you identify exactly who your audience is, what content they’re interested in and what search terms they’re actually using to find it. Book a free consultation to find out more. « Content Kitchen 13: What is keyword research?